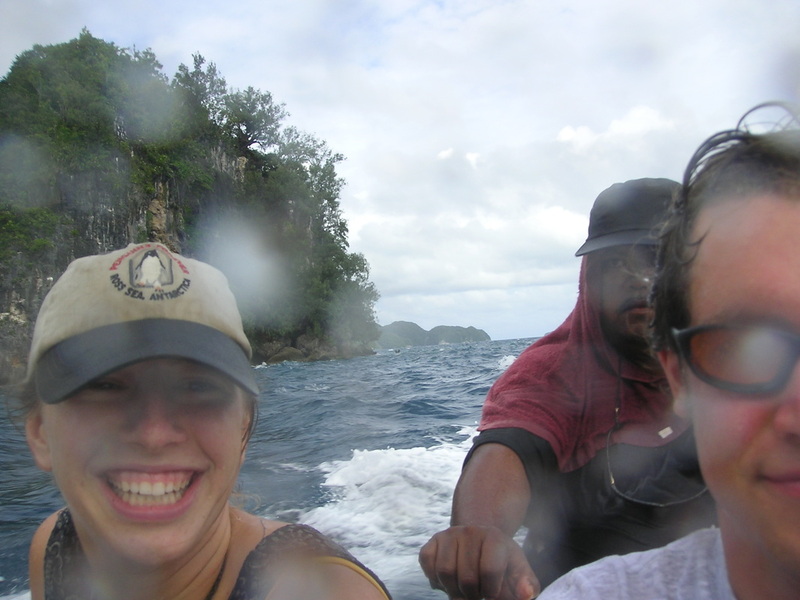 Ann Marie Gawel, Chris Carroll and Rebecca on the Belau atoll of Ngcheangel. Field work is an adventure. It can be exciting, tiring, awe-inspiring, overwhelming, dangerous, breath-taking, miserable, and sublime all in one day. In the best and worst of times, we're doing what we love and sharing with generous souls from around the world. I am indebted to all of the wonderful people who have joined me in the field and learned about creatures great and small. Well, mostly small. Very small. Tiiiiiiny. My head is fired, my spirit has not died. If questioning still the end of my employ." Bena and Rebecca at a community picnic to celebrate conservation programs on the island of Beliliou in Belau. Mr. Belhaim "Bena" Sakuma, Director of the non-profit Belau Cares, Inc., has been generously giving his time, expertise, support, and friendship to our team since 2003. He is a skilled navigator, waterman, and community leader who was part of the group pushing for Belau's Nuclear-Free Constitution. This Constitution was the first of its kind in the world and was finally achieved in 1981. One critical characteristic to any person working out in nature, including Bena, is a sense of humor. Team Snail is happy to keep him laughing, e.g. 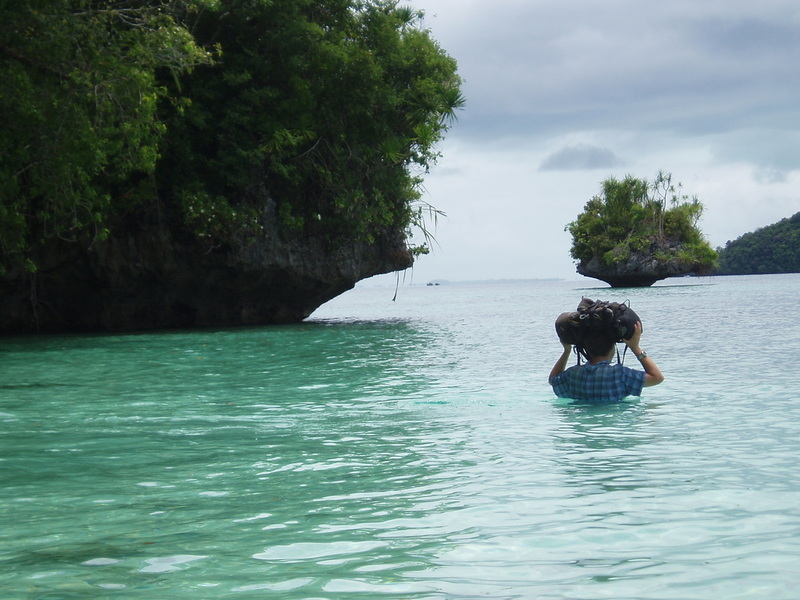 with our sea snake encounters on remote Belau islands. 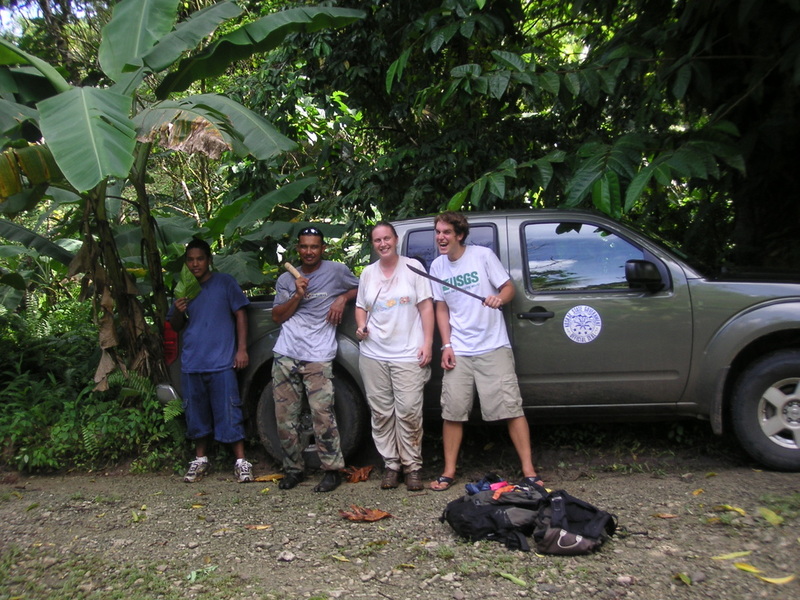 Ann Marie was part of the very first team of the Belau Land Snail Project. She worked on the team in 2003 and 2007. She earned a B.S. from University of Chicago and is finishing her Master's at University of Guam. She will soon be working with the U.S. 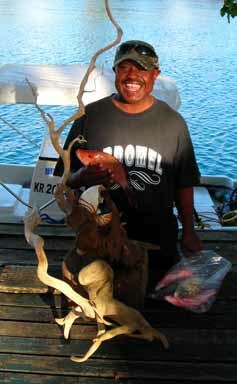 Fish and Wildlife Service in Honolulu, Hawaii. 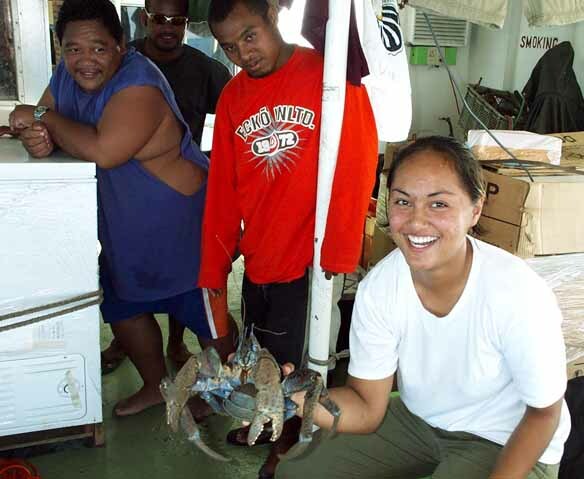 Ann Marie is an expert diver and paddler who grew up on the islands of Pohnpei (Federated States of Microensia) and Guam (USA). She has survived six typhoons. Fancy dinner with Belau friends at sunset on the deck. 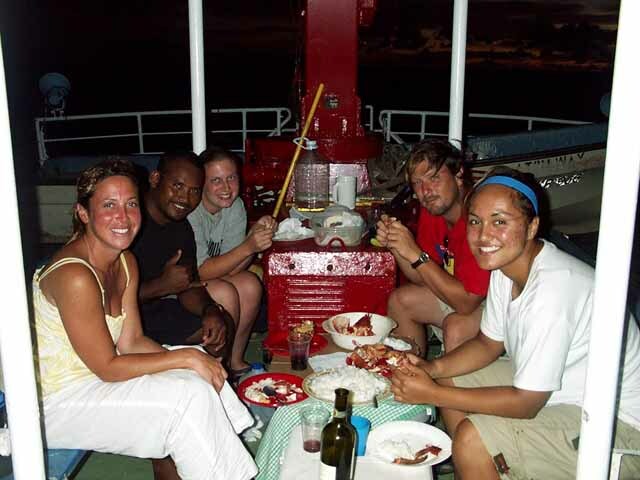 Jesse worked in Belau with Team Snail in 2005 and 2007, and continued island hopping with Rebecca in the Federated States of Micronesia in 2005. He also went on to work on arthropods with Alan Olsen at the Belau National Museum, and began some of his own projects on these little-known invertebrates. Jesse earned his B.A. from Colgate University. 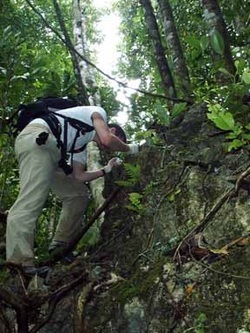 He currently works on Barro Colorado island (a research station in the middle of the Panama Canal), helping out with a variety of projects related to ant community ecology. He is also a Ph.D. student in Mike Kaspari's lab at the University of Oklahoma. Jesse is a gifted singer/songwriter and made our evenings sorting snails and cooking dinner a whole lot more fun. Rachael diligently trying to get a GPS reading through the canopy. 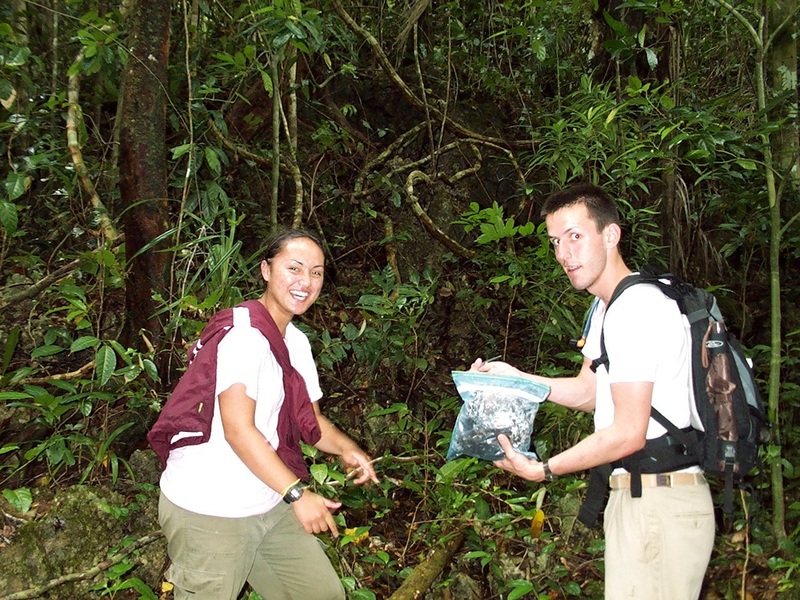 Rachael came to Belau to work on land snails in 2005, bringing with her an expertise in bird field studies. She earned her B.S. in Biology from Cornell University, and now is a Ph.D. student in the Costa Lab at U.C. Santa Cruz. Her current research involves trying to understand how marine birds' non-breeding season influences the summer breeding season and survivorship. Rachael has worked in some of the most remote and climatically punishing corners of the world, including Greenland and the Bering Sea. She has also been part of a research team in Antarctica where she studied the foraging ecology of chinstrap and gentoo penguins. In contrast, Belau was. . . hot! 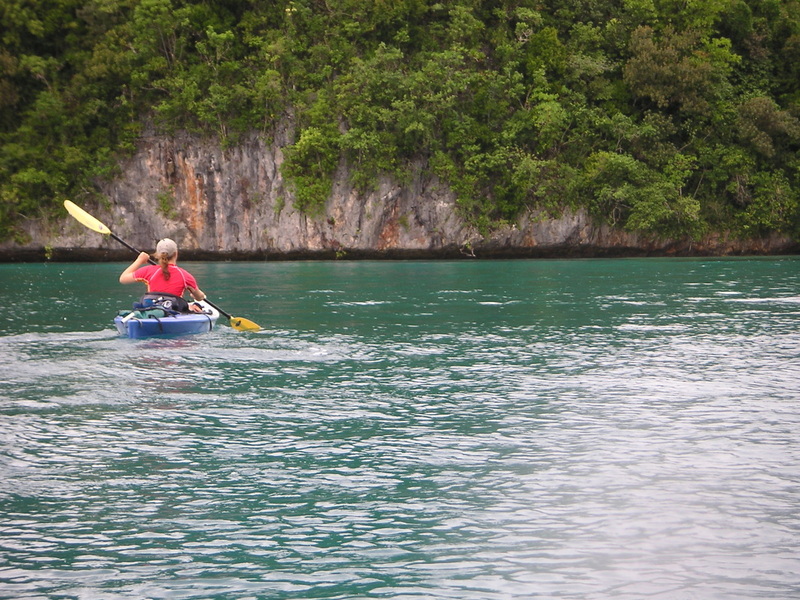 Rachael and Jesse speeding through the Rock Islands. Ric befriending an invertebrate in Belau. 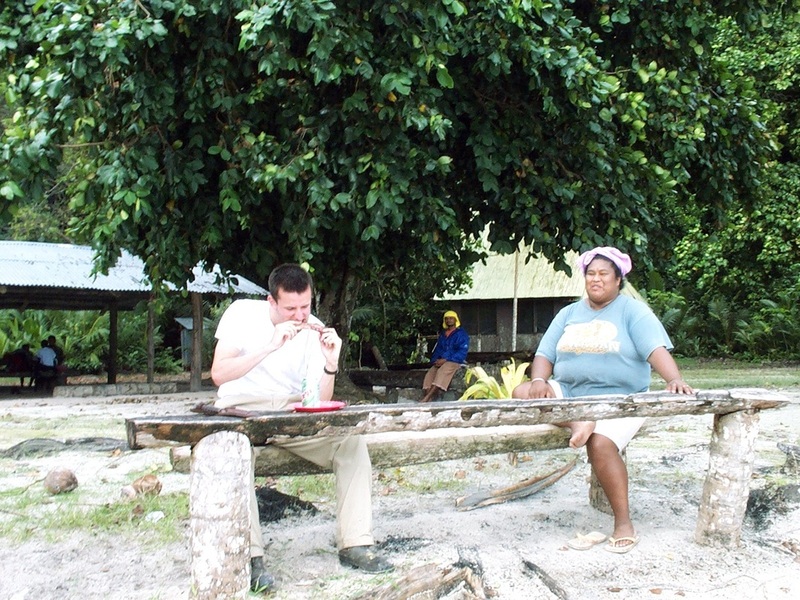 Ric came to work on land snails in Belau with Team Snail Belau in 2005. A lifelong snailophile (gastropodite? 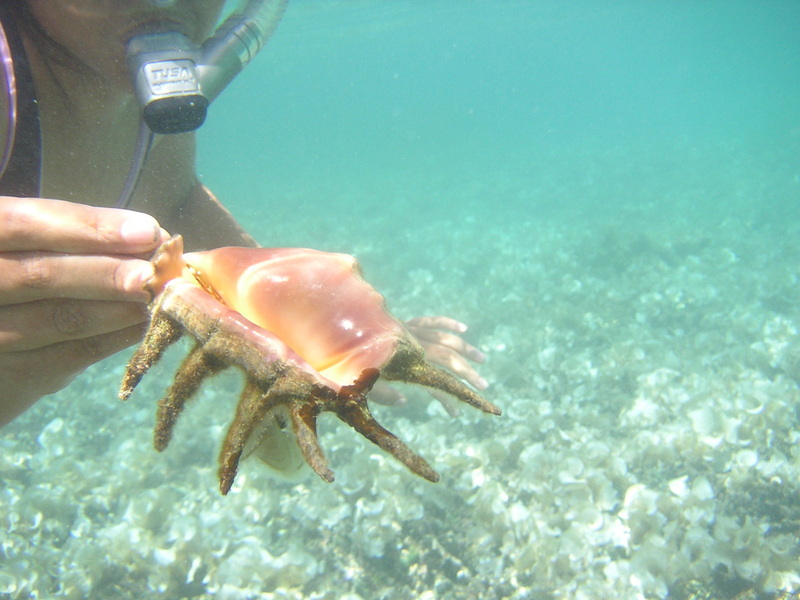 ), Ric Brewer is the past coordinator for the North American Species Survival Plan for Partula administered by the Association of Zoos & Aquariums, which coordinated efforts for the captive breeding of this critically endangered Tahitian species of tree snail. He worked for 13 years as communications manager for Seattle's Woodland Park Zoo. 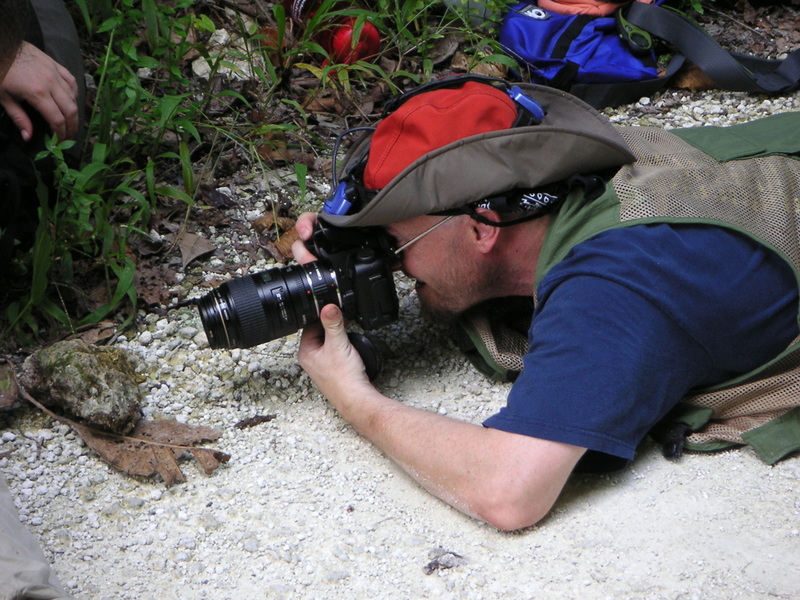 Ric Brewer documenting live snails in Belau. 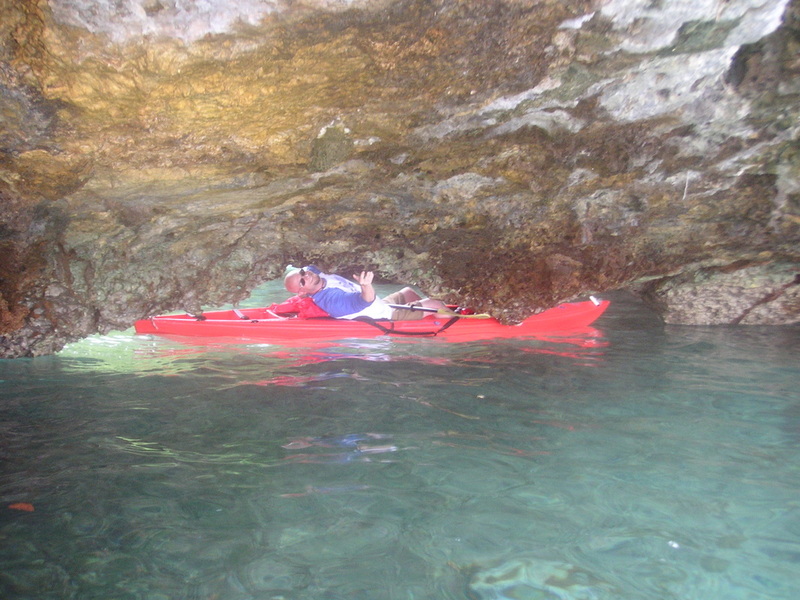 Ric squeezing under a limestone arch in the Rock Islands of Belau before the tide rises. 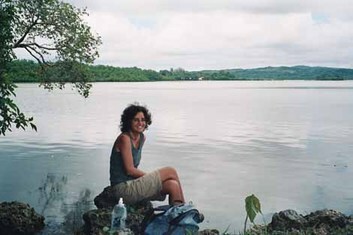 Samantha joined us in Belau in 2005, after having worked on a diversity of organisms, including slime molds, tellin bivalves and freshwater snails. She earned her BSc from the University of York, an MSc in Advanced Methods in Taxonomy and Biodiversity from Imperial College London and the Natural History Museum, and an MRes in Animal Behaviour from the University of Edinburgh and Scottish Agricultural College. More recently Samantha was awarded her Ph.D. in Population Genetics from the University of Edinburgh and the Roslin Institute for her work on the genetic diversity and structure of livestock breeds. 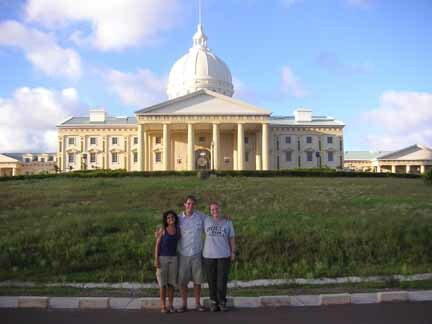 Samantha, Jesse and Rebecca in front of the new capital building in Melekeok, Republic of Palau. Chris was part of the inaugural Team Snail Belau in 2003. A native of Wisconsin, Belau was a big change climate-wise, but he was a great part of the team. He earned his BS from the University of Chicago, and then went on to pursue a medical career as a medical officer in the U.S. Navy. He graduated from medical school and is now doing his residency at the Mayfield Clinic/University of Cincinnati Department of Neurosurgery. He might someday be a medical neurosurgeon stationed in Guam. 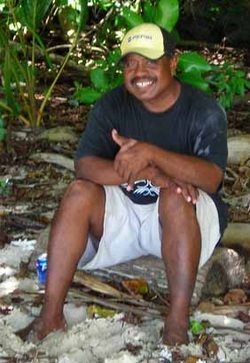 Digon Ngirkelau worked with us and our snail boat in 2007, through Bena Sakuma. 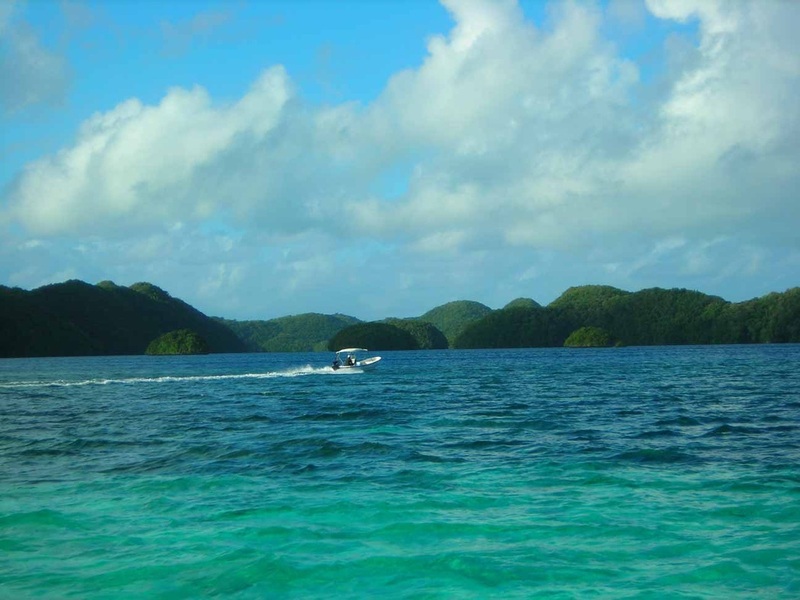 Digon has an internal navigator and tide calculator for the whole of the Belau archipelago, and got us safely in and out of some tight spots, rough seas, and bad weather. As if that weren't enough, he's also a great snailer. The field season wouldn't have been the same without him. Top: Rebecca and Ann Marie waiting out the rain in our boat. Photo: D. Mulroney, from Soft Coral Arch.